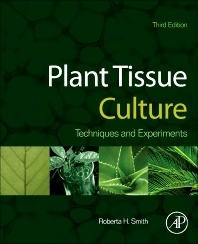 Plant Tissue Culture, Third Edition builds on the classroom tested, audience proven manual that has guided users through successful plant culturing A.tumefaciens mediated transformation, infusion technology, the latest information on media components and preparation, and regeneration and morphogenesis along with new exercises and diagrams provide current information and examples. The included experiments demonstrate major concepts and can be conducted with a variety of plant material that are readily available throughout the year. This book provides a diverse learning experience and is appropriate for both university students and plant scientists. Emeritus Professor, Department of Horticulture, Vegetable Crops Improvement Center, Texas A&M University, College Station, Texas, U.S.A.